This brightly colored plastic frog is a great little foot toy that will keep your bird amused with its hopping ability. Hopping Frogs Bird Foot Toy (Set of 13)5Diana (aka Frankie's mom)June 28, 2012These frogs are great...small and light enough for even a baby budgie (Frankie is about 3 months old) to pick up, carry around, and toss in the air. 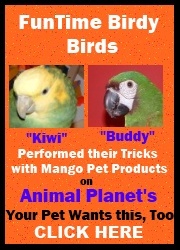 Of course, it's even more fun when you flip the frogs for your bird to chase and attack!